Japan has released Flash Manufacturing PMI data and the US will publish FOMC Meeting Minutes, Crude Oil Inventories, Existing Home Sales and HPI m/m. The support rests at 111.670 with resistance at 112.010 which the weekly pivot point at 111.780 is located in between the lines. The EMA of 10 is moving with bullish bias along the ascendant channel but it is below the EMA of 100 and the EMA of 200. The RSI is rising above the 50 level, the Stochastic is moving in high ranges and the MACD indicator is in neutral territory. The ADX is showing buy signals. 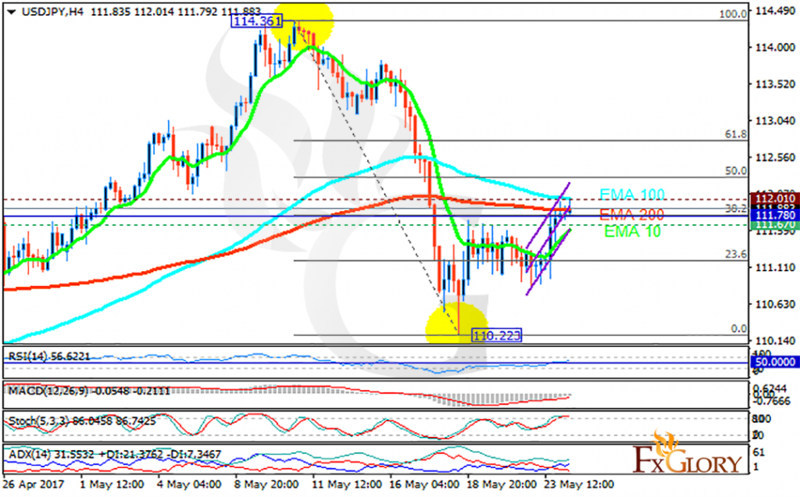 It seems that the pair has started its correction pattern targeting the 50 level of Fibonacci at 112.5.